"We researched all the breast cancer trainings out there and are thrilled that we chose Camille's. Her yoga-based rehab methods really work to reduce lymphedema, increase range-of-motion, soothe neuropathies, and aid osteoporosis. Plus, Camille is an authentic yogini: She teaches ALL facets of yoga, from koshas and pranavayus to mudras and exceptionally beautiful guided relaxations. The physicians at Christus Spohn Cancer Center sponsored the training and now are so grateful to have a yoga program of its caliber for their patients." "This extremely intelligent program is truly a work of art. I feel so fortunate to have had the opportunity to study with Camille, and now use her methods to help so many breast cancer thrivers." "Camille's methods targeted all the areas of scar tissue in my chest that NO OTHER physical therapist, yoga teacher, Pilates trainer, or exercise video have ever been able to do. She is the leading breast cancer recovery instructor in the US and abroad." Premiered in 2003, this ground-breaking program is the first to provide yoga instructors with the necessary skills to safely adapt Hatha yoga for breast cancer survivors. This population has special exercise needs and precautions according to the type of treatment received–-from lumpectomy, mastectomy and lymph node dissection to radiation, chemotherapy, and breast reconstruction. Part medical discourse, part spiritual inquiry, this training examines the complex array of physical, mental, and emotional challenges that survivors face. And explores how the science, philosophy, and psychology of yoga can aid recovery on all levels. Participants will receive a helpful packet of cancer resource materials, as well as the comprehensive Yoga for Breast Cancer Recovery & Beyond© manual. 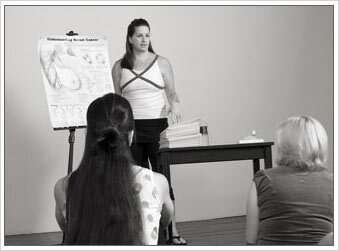 It offers invaluable, practical information for instructors, including detailed outlines of therapeutic yoga sequences for the newly diagnosed, rehabilitative sequences for post-surgery recovery, and non-injurious vinyasas for those who are years beyond treatment but at a lifelong risk for lymphedema or osteoporosis. Diverse trademarked yoga flows, including Camille's signature Recovery Arm Vinyasas™, offer far more effective teaching options than the basic yoga of other cancer trainings. Camille leads all therapeutic movement and recovery yoga classes. Participants do not forfeit workshop time breaking into simulated practice groups. The real-life teaching experience in the Practicum provides a much stronger foundation for building confidence, knowledge, and skills. $450--CHECK OR MONEY ORDER, PAYABLE TO "EXCLUSIVEYOGA"
Off-site: For Trainings at your studio or facility, fee is negotiable. "This thought-provoking, well-researched, caring and inspirational workshop should be a requirement for all 200-Hour YTTs." "With great compassion, Camille teaches her proven, step-by-step approach to help survivors reconnect with their bodies, regain mobility and strength, and heal their hearts and lives through yoga. Her supportive, gentle teaching style makes learning a complicated topic easy." "I was so impressed with this masterful, moving workshop. I urge all patients to incorporate Camille's unique yoga/stretch sequences into their daily routines--especially to help prevent or diminish lymphedema. I learned some wonderful ROM moves which I now guide my patients through before radiation. They ease chest pain and give me an effective way to help patients in their journey through recovery. " "I left this training very excited to begin the work of bringing a program to the Cancer Institute where I work in Maryland. As a seasoned instructor and workshop presenter myself, I applaud Camille for the immense work and innovation she has put into her exceptional program." "This entire workshop was marvelously creative, effective, and thorough. The guided meditation on the last day was magical, uplifting, beyond words in its heartfelt genius. Camille, your work is amazing!" "Camille, you are all soul ... and have blessed me with your healing heart. Your beautiful, artful teachings are as entrancing as they are effective. You will be a part of every class I teach for the rest of my life. I bow to you with gratitude ... and give you a big 'ol Texas-style Namaste. READ MORE QUOTES ON THE FEEDBACK LINK ABOVE.